Go from spectator to participant when you ride key sections of the tour. Choose from 24 workouts and ride a mountain stage or speed through a time trial. *Access your iFit® account from your tablet or smartphone. Requires membership, sold separately. The Bluetooth® word mark and logos are registered trademarks owned by Bluetooth SIG, Inc. and any use of such marks by ICON Health & Fitness is under license. Other trademarks and trade names are those of their respective owners. No matter the route, no matter the terrain, your TDF 1.0 automatically adjusts the incline and decline to simulate the actual landscape. With impressive 15 percent incline and decline capability, you can fully train all year for any course in the world. 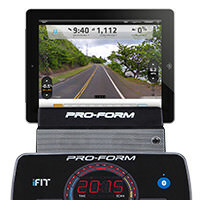 With iFit® interactive technology*, you can bike anywhere in the world. Choose from 24 pre-mapped courses or create your own. 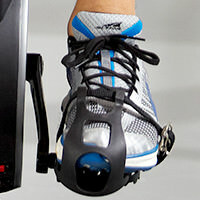 Tapping into Google Maps™, this exclusive ProForm® indoor cycle automatically simulates every hill and dip. Plus, you can track your progress automatically, compete with friends, and customize your workout to match your goals. *Access iFit® account from computer, tablet, or smartphone. Requires membership, sold separately. Trademarks and trade names are those of their respective owners. Google Maps™ is a trademark of Google, Inc. Syncing iFit® account from tablet to machine currently on Android™ and iOS tablets only. Tablet not included. Tablet requires Android 5.0+ with Bluetooth 4.0+. iPad 3 and above with iOS 8+. Climb to a striking summit, finish with the strength of rigorous cross training. No matter the route, no matter the terrain, your TDF 1.0 automatically adjusts the incline and decline to simulate the actual landscape. With impressive 15 percent incline and decline capability, you can fully train all year for any course in the world. We take your training seriously. You can smoothly move through your 26 gears down the valleys and over the summits of your personal records. Rock your workout to your favorite music. Simply plug your iPod®* into the Intermix Acoustics™ Sound System and listen to incredible sound through two 2-inch speakers. *iPod® is a trademark of Apple, Inc., registered in the U.S. and other countries. iPod® not included. The Tour de France indoor cycle was built to imitate the ultimate outdoor cycling experience. With the freewheel clutch, the circular motion is smooth and natural so you can maintain your form and pedaling technique just like you would on your outdoor cycle. 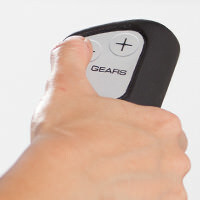 Experience a smooth, steady pedal stroke with the flywheel made to perform. A faster gear ratio and effective weight placement deliver a more natural cycling experience. Work out in comfort with this ergonomic padded saddle. Adjust it horizontally and vertically to find the right fit. Stay hydrated throughout your workout by keeping your water bottle close. This convenient dual water bottle holder is built-in to the bike frame for easy access. Designed to keep your feet in place, these ergonomic pedals are built with adjustable toe straps to increase stability. Easily move your indoor machine around the room with the built-in transport wheels. Adjust the convenient leveling feet to keep your bike stable on an uneven surface. Experience a superior workout with this durable steel frame that is built to last. The ProForm® Tour de France is protected with a 2-Year Parts and Labour Warranty. Please note: subject to registration within 28 days of purchase.